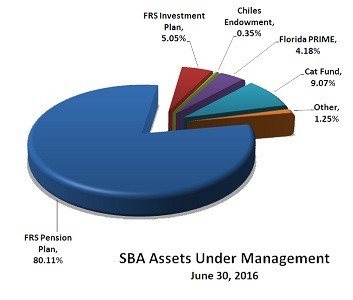 You are here: Home » Investors » How Do Pension Plans Monitor Their Hedge Funds, For Example Florida SBA? The Florida State Board of Administration runs the $141bn Florida Retirement System Pension Plan through an Investment Advisory Council. As a public body it’s papers are available online, and an exploration of the material gives an insight into the way large pension plans, and State sponsored plans in particular, operate. The graphics here illustrate the way a public pension plan monitors its managers, whether they are hedge funds or managers in other asset classes or styles of investment. First, we are going to get to the pot in which the hedge fund investments sit from the top-down. The Florida State Board of Administration overseas $176bn of assets of which the State Pension Plan represent 80% of the AUM. Within the Pension Plan there are the usual asset classes, and (as is typical) the asset allocation is managed through operational policy bands and a current target level for each asset class. The current target allocation is given in the Table below. For the Florida Retirement System Pension Plan hedge funds come under “Strategic Investments”. • Generate long-term incremental returns in excess of a 5% annualized real rate of return, commensurate with risk. • Diversify the FRS Pension Plan assets. • Provide a potential hedge against inflation. • Increase investment flexibility, across market environments, in order to access evolving or opportunistic investments outside of traditional asset classes and effective risk-adjusted portfolio management strategies. Strategic Investments may include, but not be limited to, direct investments authorized by s.215.47, Florida Statutes or investments in capital commitment partnerships, hedge funds or other vehicles that make or involve non-traditional, opportunistic and/or long or short investments in marketable and non-marketable debt, equity, and/or real assets (e.g., real estate, infrastructure, or commodities). Leverage may be utilized subject to appropriate controls. Most of the labels are self explanatory, with maybe Special Situations an exception. Special Situations in the context of this fund means those (alternative) strategies that do not fit well within the defined (other) strategies. 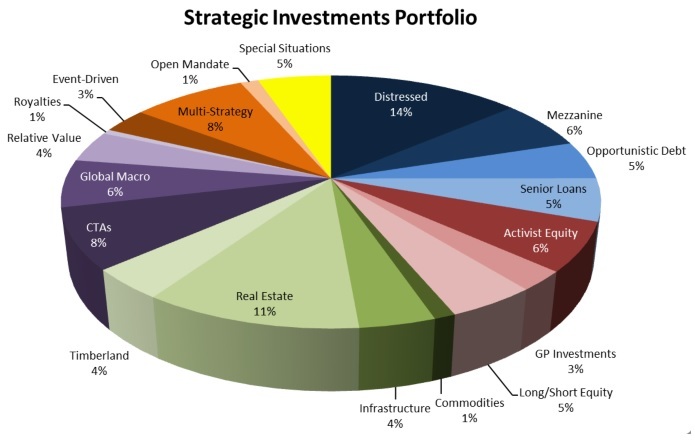 Assuming that Special Situations are all/mostly hedge fund strategies puts the total of them at 59% of the Strategic Investments section of the pension plan assets. Or $6.8bn in absolute Dollar terms, and 4.8% of total plan assets. The line-up given below is the full roster of managers at mid-year as the Florida SBA categorizes activist managers and HF managers. In particular some distressed investing managers are listed elsewhere. The inception date is the timing of the first allocation to the manager. We are now close to getting to how this State Pension Plan monitors its managers. But first comes a note on (internal) resources. Under the Senior Investment Officer for Strategic Investments, John Bradley, is a staff of five consisting of a second senior portfolio manager, two portfolio managers, and a senior analyst. In addition the Florida SBA draws on the resources of Cambridge Associates as its’ asset class consultants. Through point person Sheila Ryan, Cambridge Associates provides support and assistance with the program, including things such as market research, and help in sourcing new fund ideas. 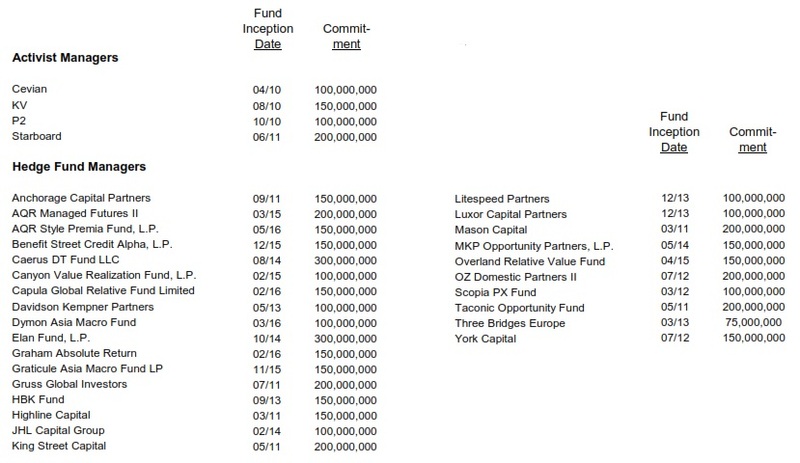 And then in addition to the full diligence that the internal team does on potential new funds, Cambridge also does their own independent due diligence on candidate firms. This is a key structural consideration for large pension plans – resourcing is a big issue whether the plan is corporate or public sector. The investment staff of the plan sponsor can carry out just about all investment tasks themselves with only an asset class-level investment consultant at one extreme. The other extreme would be out-sourcing most of the day-to-day activity retaining only strategic decision making within the in-house investment staff. These days even the CIO-role can be out-sourced – Hedge Fund Insight’s research shows that 76 organisations offer out-sourced CIO services in North America. 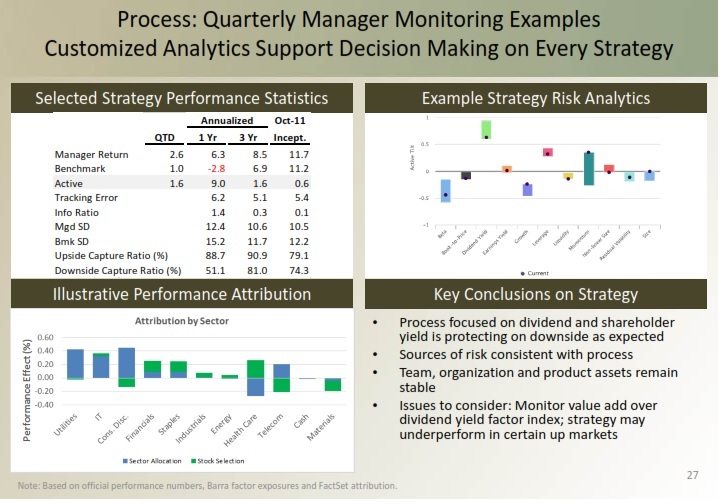 The last two graphics here show the tasks involved in monitoring managers that have been given a mandate by the Florida SBA, and an example of the analytics that go into decision-making on current managers. It is telling that there is a column for monitoring activity on day-to-day basis. The investment horizon of pension plan assets is multiple decades to meet liabilities stretching out further. Strategic asset class level targets should be set on 5-10 year basis. Mandates are mostly given on 2-3 year contracts, though we all know that they can be terminated after only a year. Reviews of manager performance happen frequently to ascertain the degree to which the targets have been met and calibrate the competitiveness of the variance of actual returns. Though there are many and varied reasons for a review to turn into a manager change. Some hiring-and-firing is top-down driven (changes to asset allocation targets, maybe arising from an asset/liability study, tactical variance at the asset class level), and some is bottom up (style-drift among incumbents, a style-shift decision may be taken within an asset class, relative returns may be beyond tolerance on a ranking basis, personnel or ownership changes at a manager). Just within the Strategic Investments section of the Florida State pension plan and within the last fiscal year (to June 2016) seventeen funds were hired and one terminated. It should be borne in mind that this part of the pension plan assets are particularly diversified by number of investment strategies (and to a much lesser extent managers). An indicator in the opposite (apposite?) direction is that the next risk assessment survey will begin in November, and thereby the SBA will move from a semiannual risk assessment survey to an annual survey. The Risk and Compliance Committee reviews the residual risks at the plan level in comparison to stated risk appetites, and the risk assessment survey is part of that work. Given the pace of change involved in Asset/Liability Modelling and the normally low potential impact of residual risk this change in frequency seems sensible. 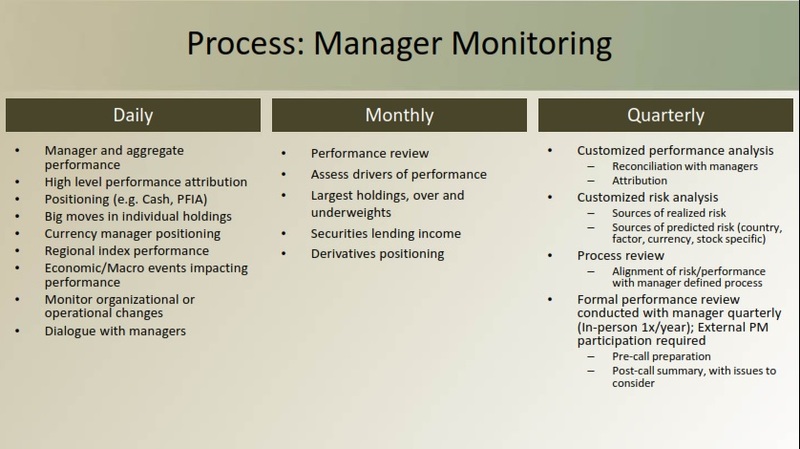 The schematic presented for the Manager Monitoring for the Florida State Pension Plan has a lot of activity displayed. All the activity probably takes place although not with the frequency implied by the positions in the columns, and not for each manager each day. Not for one minute is it feasible to check for organisational or operational changes on a daily basis across dozens of external managers. Nor would there be a dialogue with every manager every day – given staff numbers there may well be a dialogue with a number of external managers each working day. Most of the work bullet-pointed is necessary to understand the returns in the context of the markets and the mandate and the style-bucket. These are the investment-related risks at the manager/sub-strategy level. Separately SBA has put a lot of resources into developing risk management and compliance monitoring. Some of it is checking that mandate restrictions are being met (lowest level), and some of it is at the whole fund level – looking to contain operational risk and engaging in enterprise-wide risk management. The defined role of the Risk Management and Compliance (RMC) unit is to assist the Executive Director & CIO in maintaining an appropriate and effective risk management and compliance program to identify, monitor and mitigate key investment and operational risks. The performance analysis and risk analysis given in the illustration above is for an equity mandate. All mandates at the Florida SBA are tracked with reference to a benchmark. Where there is not a relevant generic benchmark the SBA uses bespoke composites of indices or one devised by Cambridge Associates. For hedge fund mandates the HFR investible indices are used for benchmarking. Trent Webster, SIO for Strategic Investment, told the Investment Advisory Council in December 2015 that though “this is the benchmark returns that we report publicly, but it’s not the only thing that we look at. We also look at how we’re doing relative to the CPI plus five percent benchmark. That’s our longer-term benchmark.” The long term real return assumptions of the program are 5% for equity long/short funds and 10% for CTAs and Global Macro, according to Aon Hewitt Investment Consulting.